Buddhism originated in India and was founded by Gautam (Lord) Buddha. 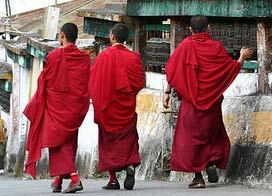 Read further for Buddhism Religion and its history in India. Mahabodhi Tree in Bodh Gaya is the most sacred pilgrimage place for Indian Buddhists. Buddhism in India - Buddhists form merely 0.7% of Indian population and most of them are concentrated in Eastern India and its neighboring countries. 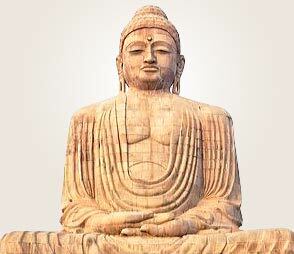 Established around 500 BC, it was propounded by Prince Siddhartha turned enlightened saint Gautama Buddha. A wealthy prince, he lived a very sheltered life until he was 29 and was kept away from all the miseries of life such as old age, sickness and death. But he got a chance to get a glimpse of all these one day, when he decided to explore the world outside the palace. This shocked Siddhartha into disinterest and to search for the real Truth. He resisted his basic needs, kept rigorous fasts and still felt that he had not advanced much. It was then he settled for the 'middle path', shunning the extremities. Finally he got enlightenment under the tree in Bodh Gaya, which is now known as the Maha Bodhi Tree and is considered very sacred by the Buddhists. Buddha suggested the Eight-fold path to attain 'Nirvana' or freedom from sufferings that includes Right Beliefs, Desires, Thoughts, Life, Action, Efforts, Behavior and Meditation. Buddhism emphasizes on Non-violence and shunned animal sacrifice and non-vegetarianism. Buddhists are neither God-believers nor atheists. They keep the images of Buddha, who is said to be the fourth prophet of the religion. The two sects of Buddhism are Mahayana and Hinayana - Mahayana Buddhists believe that the right path of a follower can lead to the redemption of all human beings while Hinayana believers follow the doctrine of each person for his own fate. Other popular sects are 'Zen Buddhism' from Japan and the 'Hindu Tantric Buddhism' from Tibet, which is a mixture of Indian Buddhism and original Tibetan beliefs.